The JumpStart Path2MBA Virtual Bootcamp and Path2MBA Diversity Forums prepares undergraduate students and working professionals to address the following. What is the Value Proposition of Pursuing an MBA? How to craft a Game plan for now or in the future (application, test prep, interviews, essays, etc.)? Which MBA programs might be a good fit? 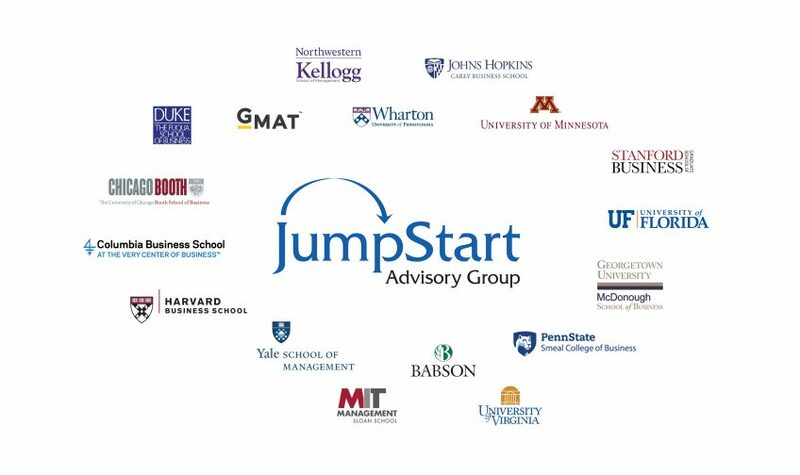 JumpStart partners include: The Fuqua School of Business (Duke), Harvard Business School, Wharton (University of Pennsylvania), Stanford Graduate School of Business, the University of Chicago Booth, Columbia Business School, Georgetown’s McDonough School of Business, MIT’s Management Sloan School, Johns Hopkins Carey Business School, Kellogg (Northwestern), Yale School of Management, Babson College (Olin), University of Virginia’s Darden School of Business, University of Florida’s Warrington College of Business, University of Minnesota Carlson School of Management, Penn State Smeal College of Business & GMAC (General Management Admission Council). We believe your professional aspirations are achievable and we seek to provide support for you to get there. Over several years, individuals typically have three key questions that we address as part of JumpStart’s Path to MBA approach. Are you seeking guidance on how to prepare for a Path to an MBA? In collaboration with our partners starting in March, we break down idea of pursuing an MBA, the application process, nature of life in business school, what differentiates MBA programs, and provide guidance on how to navigate the application process. This preparation approach supports our network in the process to apply this coming year or potentially further out. Are you seeking an in-person experience to engage, network, and learn about MBA Programs by connecting with admissions officers? Our flagship 1.5-2 day Forum puts you in direct contact with top MBA programs. Sessions include Meet the MBA programs, School Overviews, How to Craft Your Story, Networking sessions, and 1:1 chats. Are you interested in participating in Prospective Candidate opportunities w/top MBA Programs? A limited number of MBA programs offer “invite only” A day in the Life on-campus experiences for prospective candidates. Some MBA programs have opportunities for individuals still in college (i.e. deferral programs). Some programs waive application fees. Our partners communicate opportunities to the JumpStart Network. The first deadline is in March. Click to Apply Now!